In 1933, Universal Studios released a horror film about a scientist who develops a serum that makes him invisible. The film was based on a novel by H.G. Wells, and starred Claude Rains as a man who loses not only his body, but also his mind. In 1951, Universal Studios decided to pull the Invisible Man concept out of the drawer and try it on again, this time featuring comedy superstars Bud Abbot and Lou Costello, they of “Who’s on First” fame. Abbott and Costello had already made several comedy/”horror” films for Universal, such as Abbott and Costello Meet Frankenstein and Abbott and Costello Meet the Mummy. But Abbott and Costello Meet the Invisible Man is not a horror film, and it’s not much of a mystery. It’s actually an amusing film about the world of boxing. Or, rather, Invisible Men in the world of boxing. In this madcap adventure, Abbott and Costello are detective school graduates. While they move into their new office and brag about how smart they are, a man bursts through the door. They don’t realize that this intruder (Arthur Franz) is a boxer who has just escaped from jail, where he was imprisoned for the murder of his manager. Franz hires the pair to drive him to a doctor’s home – the same doctor who has uncovered Claude Rains’ Formula That Makes People Invisible. Franz, desperate to clear his name, takes the serum so he can better spy on people. Meanwhile, Abbott and Costello learn Franz’s identity and plan how they can turn him over to police so they can collect a hefty reward. The usual Abbott and Costello formula is at play in this film: Costello discovers the Invisible Man first; Abbott doesn’t believe him. When the Invisible Man plays tricks on Abbott, Abbott blames Costello. 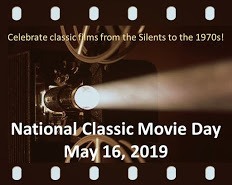 There are lots of fun, if low-tech, visual effects: doors opening by themselves; floating cigarettes in the hallway; and Costello fighting with the Invisible Man over a plate of spaghetti. We also cheer when the Invisible Man lands some terrific punches on an opponent (a bad guy) in the boxing ring. The opponent is in a fixed boxing match with the hapless, in-waaay-over-his-head Costello, and we can’t wait until the Invisible Man shows this thug a thing or two. Abbott: [motioning to Invisible Man] I hope he has his driver’s license. Costello: I hope he’s in the car. Abbott & Costello Meet the Invisible Man has a completely ridiculous ending, but what Abbott & Costello movie doesn’t? Besides, if you’ve bought into the premise of an Invisible Man, the ending shouldn’t be too much of a stretch. 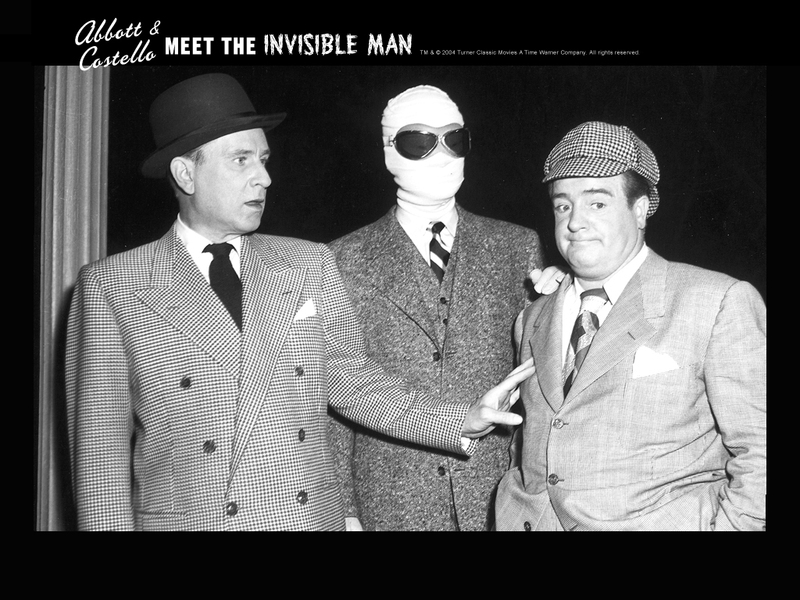 Abbott and Costello Meet the Invisible Man: starring Bud Abbott, Lou Costello, Nancy Guild. Directed by Charles Lamont. Screenplay by Robert Lees, Frederic I. Rinaldo, John Grant. Universal Pictures Co., B&W, 1951, 82 mins. Boy I love Abbott & Costello! For that matter, I sure do love the Invisible Man also. I watched the Claude Rains classic last night and was trying to determine what my children and I would be watching tonight, but you have clearly made the choice for me. Thanks for bringing a smile to my face, on an otherwise dreary morning! This Abbott & Costello film is a bit more toned-down than previous adventures because the fellows are a bit older here. But it’s still a classic A&C movie! A Blast all right! Abbot & Costello were Saturday afternoon movie fare back home, too, and we all loved ’em! For many of my generation, their “horror” films were our introduction to the genre. We weren’t old enough to see the “real” thing and Abbot & Costello were comedians. No harm with that. Abbot’s creepy side went right over our heads, where it stayed for some time. I still enjoy them, only now with an additional appreciation of how far we’ve come. Oh yeah, the Abbott & Costello “horror” movies were great to see as a kid – and great to see as a grown-up, too. Today I was listening to an interview with Jerry Seinfeld, who expressed awe at how A&C constructed their routines, e.g. the “Who’s on First?” routine. He said they were brilliant, which they were. Oh, I see Bud and Lou and I’m in, no matter what! They never fail to delight me, as did your great post! Thanks! They always give you your money’s worth, don’t they? The belated fame that surrounds A&C MEET FRANKENSTEIN has overshadowed A&C MEET THE INVISIBLE MAN. I think the latter is actually the stronger of the two…and also a very funny film. John Fulton always did a nifty job with his invisibility effects, from Universal’s first through this one (the last I believe). Fulton’s effects are so much fun. I couldn’t get enough of ’em! I feel so sheltered sometimes. I have never seen an Abbott and Costello movie although I’ve heard of them. I learn a lot from you, Ruth. Thank you for sharing and enlightening my life! Aww, thanks, Shari. Abbott & Costello can sometimes be a bit manic in their movies, which is why I like this one. The zaniness is toned down a bit, but it’s still lots o’ fun.